One of the first places that came to Pra’s mind whilst planning out the eating portion of her big Australia trip was Chef Matt Moran’s ARIA. The Brisbane restaurant has two Chef Hats with a French modern-style menu and I’d heard nothing but good things about it…plus, it’s Matt Moran! So I arranged a reservation, made sure I was sufficiently hungry and headed to the fabulous venue located right smack bang in the middle of Brisbane’s CBD by the waterfront. It’s one of those places that does everything from business lunches to romantic dinners, and they do it all well. And you can’t beat the views! 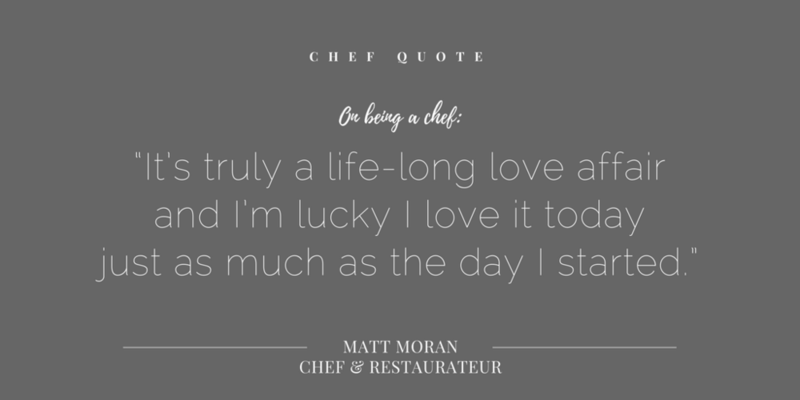 Although Chef Matt Moran wasn’t available to meet at the time, I did manage to do a remote Q&A with him (win!). On top of that, I had the chance to have a lovely chat with Head Chef Ben Russell, who kindly popped out of the kitchen to answer some of my questions (double win!). Don’t be intimidated by the crisp white linens and exquisite service—there are no upturned noses here. The staff were super friendly and clearly treating everyone, from ties to (smart) denim, with the same courtesy and respect. ARIA Brisbane may be at the top end of the two Chef Hats scale but the humility remains. Maybe (and this is just Pra’s opinion) the simplistic design could be deemed as a tad dated but nonetheless, the restaurant still oozes sophistication and has that je ne sais quois happy vibe that keeps drawing in hungry diners through its doors. They’re very good about adjusting the brand to the audience and playing to their strengths. Take ARIA Sydney, for example—it’s the Opera House lovers restaurant and that’s what they cater to. But ARIA Brisbane, being opera house-less, instead offers up amazing views of the bridge and river and that’s one of the drawing factors. The food is beautiful, from veggie dishes to meat, and I have to give a special shout-out to the yellowfin tuna—a total knockout! Also, watch out for the rye and caramelised onion bread—it’s nice but far too naughty and you won’t be able to stop reaching for it. 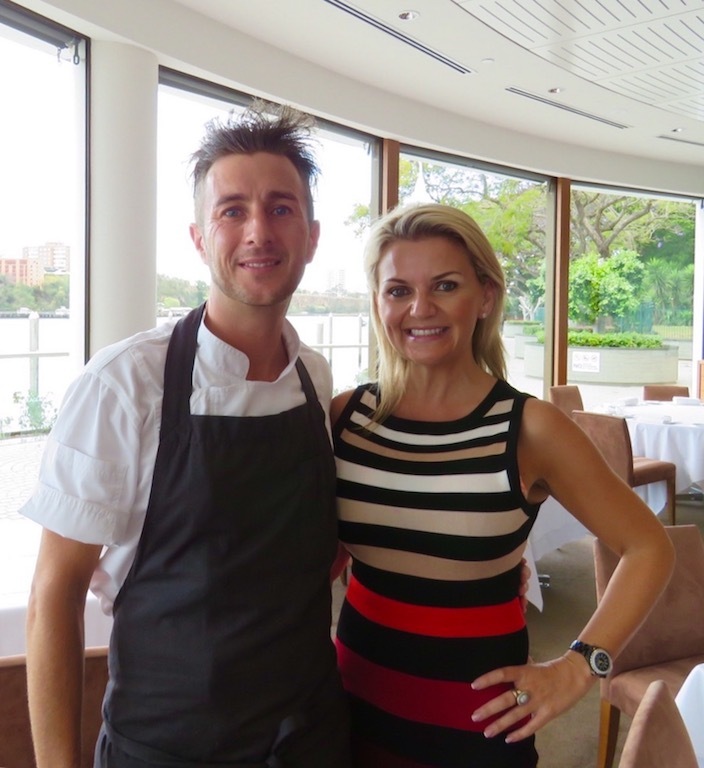 What a lovely treat it was to chat with ARIA Brisbane’s Head Chef Ben Russell, who you might call Matt’s Brisvegas wingman (but is also so much more than that!). Ben worked in France, Melbourne, London, and started at ARIA Sydney in 2004 before moving over to Brisbane seven years ago to kick off the ARIA foodie scene. It’s been full throttle for him, Matt, and the restaurant ever since! I asked Ben about some of the restaurants he loves (aside from ARIA, of course!) and he mentioned Julius Pizzeria in South Brisbane (sister restaurant to Beccofino), as well as Happy Boy in Spring Hill and Tartufo. Looks like I have three more reasons to come back to Brisbane!! Editor’s note: answers have been edited and condensed for clarity. Could you give us a brief overview of your background? How did you learn your trade? My early childhood was spent on a farm in the countryside of New South Wales, Australia. I have great childhood memories of life on the farm and looking back, it’s probably those early years that inspired my love of food, farming and living off the land. As a kid I didn’t grow up desiring to be a chef, though. It basically came about when, at 15 years old, I decided I hated school and wanted a way out. I must have had about 20 interviews until finally, I was offered a trial at La Belle Helene (I had no idea it was regarded as one of Sydney’s best restaurants at the time). Up until that point, I had very little knowledge of food and had only dined at a restaurant a couple of times. But from the minute I walked into that kitchen, I just fell in love with it. 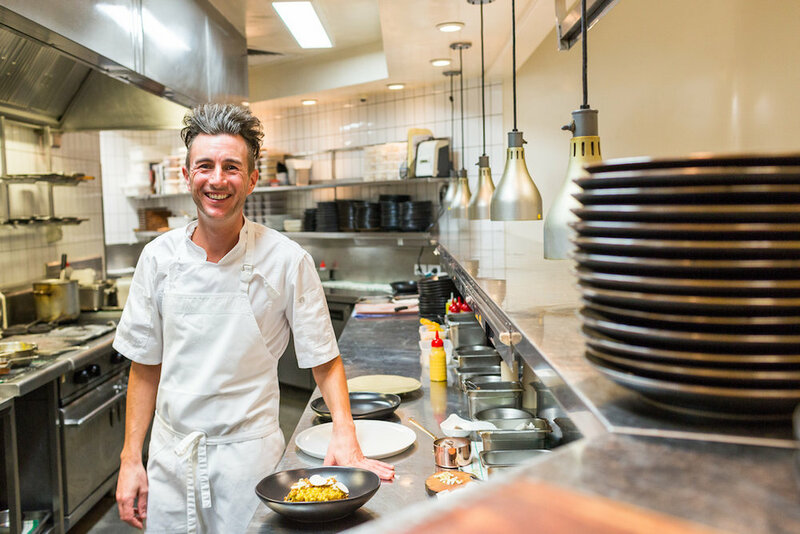 Where did the spark to become a leading chef and run your own business come from? It may sound clichéd but any drive that I have is purely from loving what I do. As the saying goes, ‘do what you love and you’ll never work a day in your life’. My passion for food, the industry, farmers and producers, my staff, my family—it’s a combination of all the things around me that keeps me motivated. But I never set out to own restaurants or have a profile; it just naturally evolved that way. When I started out 30 years ago there were barely any cooking shows, chefs weren’t that well known outside of the industry and you rarely even heard of them owning restaurants. We were just the guys in the kitchen. What has been the number one secret to your success? It’s tricky to say really, but I guess hard work, dedication and loving what I do. This industry isn’t easy—you have to be committed and genuinely love it. Biggest learning in your career to date? Gosh, where do I start!? I had very little knowledge of food when I started out. I’ll never forget my first day as an apprentice when the head chef asked me to strain a game stock. I had no idea what that was so I poured the liquid down the sink and duly presented him with the bones. Needless to say, the proverbial hit the fan. There’ve been countless learnings and each has gotten me to the next step—there isn’t really one defining moment. I’m still learning. That’s the great thing about this industry, there’s never a dull moment and you can never know it all. What keeps your regulars coming back time and time again? Restaurants are really about the full package. It’s the whole experience and what it makes you feel. Food is one aspect and primarily what people are there to enjoy but it’s equally as much about the service, wine list, interiors, location, atmosphere and an ingrained sense of hospitality. We really make an effort to recognise our regulars and the locals in the area and deliver what they want. I chat to them a lot when I’m in the restaurants. Could you name one culinary legend who has inspired you throughout your career? What’s your secret behind creating your menu—where do you gain inspiration? I definitely look to Mother Nature and seasonality. The changing seasons and fresh, locally sourced produce play a big role in my cooking. It always has, particularly as a farmer. We change the menus at each of my restaurants every season to highlight Australian ingredients at their prime and let them speak for themselves. In your eyes, what’s the most underrated ingredient? Salt. Nearly every recipe uses it but it’s rarely spoken of as a hero. It’s amazing how much this one ingredient can bring to a dish and sometimes, if it’s not quite right, an extra pinch of salt is all that’s needed to bring a dish to life. Which ingredient gives you the most diversity? There are many but eggs come to mind first. Maybe that’s because I’ve just come from my farm, where I’ve got chooks! But eggs are used in such a wide spectrum of meals and dishes from breakfast through dinner, they can be used within appetisers, entrees, mains, dessert. They can be sweet or savoury, used within beverages—they’re just an incredibly versatile ingredient. With locations in QLD and NSW and a range of brands within the group, what is the secret in maintaining brand consistency across the board? I think a lot of it is instinctive. Everything is really considered but I also trust my gut a lot. Many of our venues are deliberately unique from one another or speak to a different market. There are a few common threads, though—in particular, consistency in service and product. Whether it’s a casual venue or fine dining, we always want to ensure our guests enjoy quality food and service in a great atmosphere, across the board. With restaurants in multiple locations such as ARIA or Chiswick, they may speak to their own market but there are still similarities that unify the brand. Has your work in the media meant compromising your passion with food and being “on” and “in” the business or has it helped in terms of reaching out to the general public and strengthening the brand? My brand and the restaurants are obviously intrinsically linked, so one works for the other. It goes without saying that media exposure helps drive traffic to the restaurants and having those restaurants helps the brand. But being in media and having a profile just kind of happened naturally. Because it’s not something I deliberately set out to do, it hasn’t compromised anything. My restaurants have always been my pride and joy and are still the first priority. I’m very much involved in the day-to-day running of each venue, in every single menu, in each department such as finances and marketing. I still interview our key staff. We are based in Dubai—what’s your take on Middle Eastern cuisine? I was lucky enough to visit Dubai earlier this year and Ioved it. There are some great restaurants there and given that many ingredients have to be imported, I was really impressed with the standard and quality. The local tea houses are amazing, too. I’ve always been a fan Middle Eastern cuisine and should probably cook it more often! I tend to use the spices a lot—at home, we often have lamb with dukkah sauce and I love using harissa in dishes to give it that extra kick. Hard to say! Maybe Escoffier, my family, David Bowie 😉 Interesting mix. If you could rewind, what’s the one piece of advice you would give yourself? Probably just to keep at it and work hard but to also have peace of mind in the process that things will work out. I do pay attention to reviews from critics and customers. Feedback is always important, it helps you raise the bar. Chef Hat awards—a must-have? What are your motivators behind gaining Chef Hats? Of course, recognition is amazing and I am truly grateful for any that we receive. But Chef Hats have never been the main motivator. Don’t get me wrong, they’re an important part of the industry and are definitely nice to have and it’s an unreal achievement to gain them. I just don’t believe they should be the main driver or the endgame. They’re an honour but they can’t be the sole reason for improvement. I just think that if you focus on what you’re doing and how you can improve, or change, or do things better for all the right reasons, then in most instances recognition will naturally follow as a result of that. I like to think so, anyway! Ha, I like how you threw that in! It depends on my mood and what I’m hungry for. I tried a new place called Huxton’s at Bronte this week and loved it. It’s a great little local place with good food. Just persevere and keep at it. No matter how many kitchens you step into, it’s really about those collective experiences and gaining enough knowledge to be able to work your way up. It’s a tough industry and the hours are long but if you genuinely love it and work hard it can be so satisfying and rewarding. I know what I want and I can be a perfectionistic at times but I like to think I’m approachable and fun to be around, as well. Honest is probably another one. I tend to just say it like it is, always have. 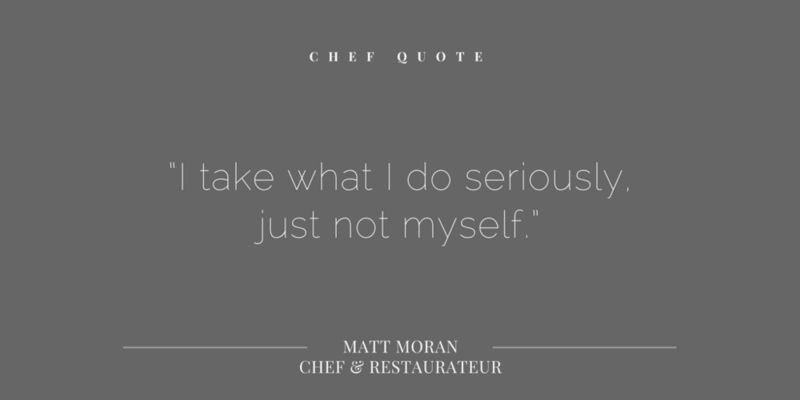 What’s the one misconception the general public have about Chef Matt Moran? For the majority of people who know me, they know I love what I do and work hard at it (in fact, they’re often telling me to slow down) but they also know the lighter side and that I like to have fun and laugh a lot. I’m a goof and a joker so the biggest misconception is probably that I’m always intense and very serious. Where will Matt be in ten years? I wouldn’t have a clue! Still doing much of the same, no doubt. I tend to be pretty restless so I have no plans to slow down. I’ve got several projects in the pipeline and within the next year or so I’ll be opening a few new venues. As for 10 years on though, who knows what the future holds. But I’m ready for it, so it better be ready for me. These two chefs are on a mission! 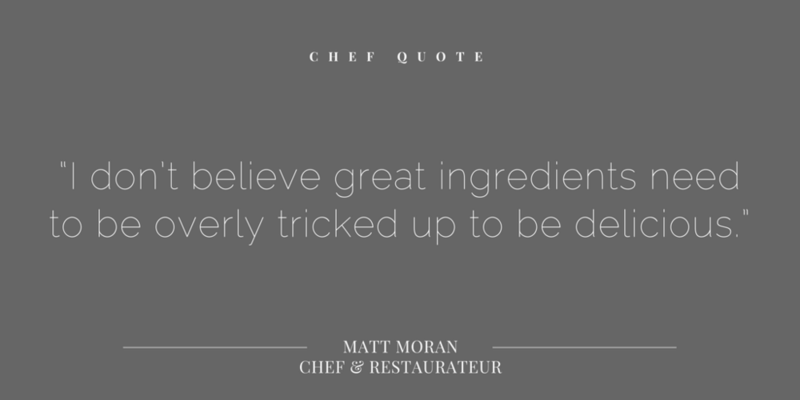 And we are so ready for whatever else Chef Matt Moran and Chef Ben Russell want to bring to the foodie world (or beyond! ).